The Volta Region is a place of sublime natural beauty, with palm-fringed sandy beaches, mangrove swamps, and grasslands in the south and lush, rolling forests and farmlands in the north. Waterfalls, caves, the vital wetland Keta Lagoon and the vast, man-made Volta Lake, which curls around the Digya National Park, are all part of the region’s terrain, over half of which lies in the Volta River basin. The region has a lot of natural areas that have become big ecotourism destinations. 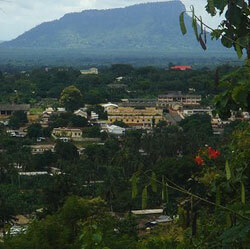 People of many different cultural groups Live in the Volta Reigon. The town of Ho, capital of the Volta Region, is still rather rustic. Only the main roads are paved. It is green and rather quiet, but has a busy central market that draws people from all over Ghana and from neighbouring Togo. It also has a number of churches, including a Roman Catholic cathedral. There is a variety of restaurants that serve local and international food and plenty of local street food stalls for more adventurous diners.